Today I had the honor of preaching for Pastor Bill Reeves who pastors the NORTH PLATTE BAPTIST CHURCH of North Platte, NE. This dear man of God has been pastor here 8 years. He started with 11 in attendance and today they broke their Sunday school record. This morning at the offering time the pastor told the congregation that the entire offering would be taken up for Evangelist Monte Watts who will be undergoing open heart surgery in the near future. I was thrilled when I heard the announcement. The church took up a $ 1,000 offering for Brother Watts. I asked churches several weeks ago to choose a week within the next 20 to 25 weeks to make up for a lack of love offerings by taking up an others offering for Brother Watts. One of the honors of my life as I travel the country is to meet some of our former students of TEXAS BAPTIST COLLEGE who are serving faithfully their Lord in their home churches. Brandon and his dear wife are a vital part of the team of the NORTH PLATT BAPTIST CHURCH. God has given us 420 graduates who are serving the Lord in local churches. The pastor picked me up at the airport on Saturday and drove me to the motel and later on that evening took me out to eat with his dear family. We had a great time and this family loves to have fun. 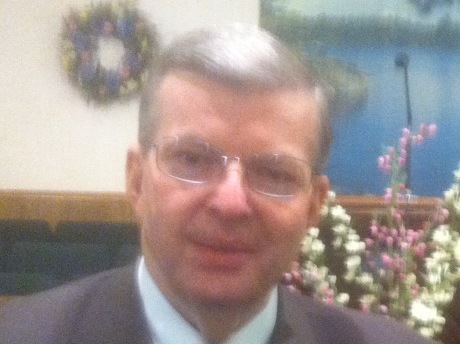 The pastor has been pastor of the NORTH PLATT BAPTIST CHURCH for 8 years. All records were broken this morning and the people certainly were excited. Several new families visited and some came back tonight for the service. I to this day do not understand why it is such a controversial subject to speak of “incorruptible seed” and “corruptible seed” as the Scriptures so clearly put it (I Peter 1:23-25) and then preachers debate it as if it was a debatable matter. Keep those cards and letters coming folks. GOTTA LOVE THE KING JAMES BIBLE!!!! !